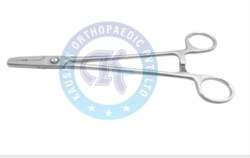 With our vast experience and knowledge, we are engaged in manufacturing an extensive range of Knee Surgery Instruments to our esteemed clients. All these systems are well designed and are highly demanded by our clients. These systems are sturdy in nature and ensure long lasting life. Some of them include Martin's Cartilege Clamp, Smillies Kneejoint Retractor, Smillies Meniscus Knives. In the series of intruments, we are also manufacturing, supplying and exporting an exquisite range of Martin''s Cartilege Clamp to meet the requirements of our clients. These Clamps are strong and sturdy in nature and are highly durable as well. Made up of high grade raw material these instruments are stringently tested as per the international standards. 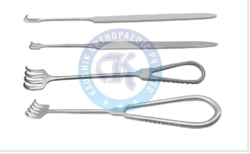 These instruments are sturdily designed and are highly appreciated by our customers. 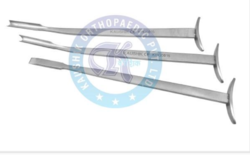 Looking for “Knee Surgery Instruments”?